Box Text: You are a prisoner on an alien planet that is made up of mazes. Robot gangs hunt you and you must shoot them before they hit you. Evil Otto, a grinning sinister face who is invincible, pursues you. If you can keep cool and not go bonkers, you'll eliminate robots, escape Evil Otto, and score big points. 02-02-2012 pacpix Box Text You are a prisoner on an alien planet that is made up of mazes. Robot gangs hunt you and you must shoot them before they hit you. Evil Otto, a grinning sinister face who is invincible, pursues you. If you can keep cool and not go bonkers, you'll eliminate robots, escape Evil Otto, and score big points. 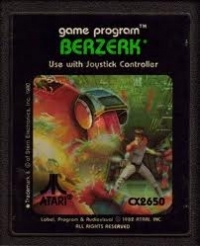 This is a list of VGCollect users who have Berzerk (Picture Label) in their Collection. 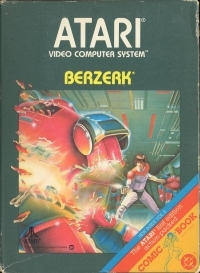 This is a list of VGCollect users who have Berzerk (Picture Label) in their Sell List. 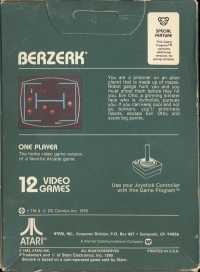 This is a list of VGCollect users who have Berzerk (Picture Label) in their Wish List.